DRIFT 1:10 DECALS - STICK WITH US! 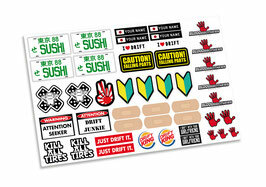 Small pre-cutted funny decals for your 1:10 rc drift car. Fit perfect on all 1:10 drift cars! This set contains 4 license plates. You can choose a license plate number we've made or you can send us your own with a max of 5 letters.